Lead sheets of this great Gigi Gryce standard in three different keys, as well as an intermediate-level solo piano arrangement, plus transcriptions of Farmer's and Gryce's solos on the first recording. "The Gigi Gryce Project" version has Minus You audio tracks for all instruments plus parts for Piano, Bass and Drums, as well as a Duet arrangement with audio. 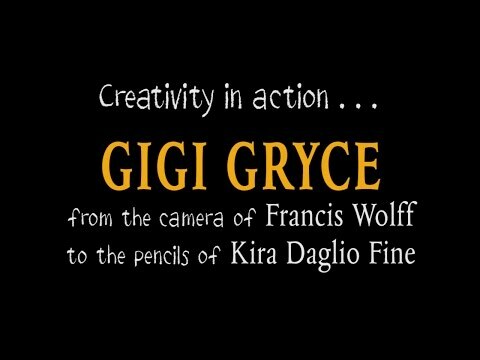 Kira Daglio Fine, saxophonist and composer, demonstrates another talent as she translates Blue Note photographer Frank Wolff's photo of Gigi Gryce into a drawing. Background music is Gigi's Social Call performed by Gigi and trumpeter Art Farmer. John Worley, Jr., trumpet; Jim Mair, tenor sax; David Matthews, piano; Marc Van Wageningen, bass; Paul Van Wageningen, drums; Scott Prebys, congas; live at the University of Mary Jazz Festival, Bismarck, North Dakota, 2008. A lyrical melody over a great chord progression. Our audio excerpt starts with the melody but Gigi's four-measure two-part question and answer intro is notated in all parts as are the alto sax harmony parts. Instead of returning to the original A section after the solo choruses, Gigi would often write a new A section, which we've labeled "shout chorus." The shout chorus would then Dal Segno (D.S.) to the bridge. You'll find all of this notated in each leadsheet. Separate rhythm section indications are also shown in the C treble clef lead sheet. Note that the lead sheets for the Byrd/Gryce version and the Minus You Gryce Project versions are identical and are in E-flat concert, while the Farmer/Gryce version is in D-flat and the Art Blakey version is in A-flat. This is the first recording of one of Gigi Gryce's most important "jazz standards." The vocal version of Social Call became a pretty big hit in the 1950s and it's still popular with singers, naturally. Transcribed Trumpet and Alto Sax Solos: Solos by both Gigi Gryce and Art Farmer are available. Our audio excerpts give you the start of each solo. Art Farmer trumpet takes the break and is the first soloist. Gigi alto is the next soloist. This is an interesting chord progression to solo on and a great relaxed groove. Both soloists are true lyrical masters with great note choices and melodic phrases. Their articulations are carefully notated. B-flat and concert instruments are in for a treat, because both Gigi's and Art's solos are available in those editions for study and comparison. Don Sickler: "This composition has a lot of harmonic depth, with the melody starting on a ♭5 which then moves to the ♯5 with the next harmony. In attempting to write an easy solo piano arrangement, it's always important to me not to water down the composer's harmonic concept. My goal is to keep the composer's chord progression. I could have kept the last A the same as the first two As, but I couldn't resist making a couple of counter line adjustments for variety." This recording is in A-flat concert. Our Concert Condensed Score shows all of the instrumental counter lines that Gigi wrote around the melody. These counter lines, however, would make the lead sheets look too complicated, so the lead sheets are just faithful to the arrangement, without counter lines, so you can enjoy playing this song in A♭ concert. The second instrumental recording of this song, this version is actually based on the Social Call vocal version that Gigi arranged for singer Ernestine Anderson that was recorded on October 22, 1955. For this Blakey recording it is a trumpet feature, with the other horns playing the same punctuations as in Gigi's vocal arrangement. The key is A♭, the same as the vocal version, but the tempo is slightly faster here, on the master take. Though solos are opened up without backgrounds, a one-measure send-off on the first measure of the first solo chorus has been retained from the vocal arrangement. While the original vocal version is focused on the arrangement and vocal feature, this arrangement is much more geared towards instrumental soloists. Instead of half a chorus of alto sax, as in the original, the solo section is opened up to feature a chorus each of tenor sax, trumpet, alto sax and piano. There are no backgrounds behind the soloists, either. However, like the original, the out head starts at the B section and continues through the coda. Gigi's other instrumental recordings of this song are in different keys. Note that the lead sheets for the Byrd/Gryce version and the Minus You Gryce Project versions are identical and are in E-flat concert, while the Farmer/Gryce version is in D-flat. Alternate take 4 is considerably slower than master take 5. The "send-off" on the first measure of the solo chorus is used for all three horn soloists (tenor, trumpet, alto) on this take, rather than for the first solo only as on the master take. This alternate take only became available on CD in 1995 ("Second Edition 1957)". This expanded lineup added Lee Morgan (featured on the melody on this song; this was his first recording with Blakey), Melba Liston, Sahib Shihab, Cecil Payne, and Wynton Kelly to the Jazz Messengers of the time. Though Blakey often played with Wynton Kelly, this is the only Blakey-led recording with him. (The Messengers' regular pianist at the time was Sam Dockery.) The only other song recorded on this date was another by Gryce, A Night At Tony's. This later arrangement, which is also used for our Minus You version, is a very different setting for the song. Much faster and in the key of E♭, the head is arranged in almost the same way as on the Art Farmer recording. There is a different intro, a four-measure phrase that descends to the tonic like the last four measures of the head. Like the Farmer version, the trumpet and alto sax each take one chorus to solo. However, instead of splitting a chorus between piano and bass, Wynton Kelly takes a whole chorus himself. Donald and Gigi then trade fours with Art Farmer for a chorus before returning to the melody. Unlike the Farmer version, there is no arranged tag at the end of the head. There is no shout chorus and no coda; the out head ends abruptly at the last measure. Social Call was one of three songs recorded on the August 30, 1957, session, all of which are Gryce compositions and had been recorded earlier with Art Farmer on the "When Farmer Met Gryce" album. The others are Satellite and Evening In Casablanca. Four other Gryce songs were recorded first in a quintet setting with Farmer (see above) and later by the Jazz Lab Quintet with Donald Byrd: Blue Concept, Blue Lights, Sans Souci, and Capri. Our "Gigi Gryce Project" version has essentially the same arrangement as the Byrd/Gryce Jazz Lab recording shown above, to the left. However, it's quite a bit slower. The horns play the melody separately, rather than in unison together, where it is not harmonized: alto sax on the first A section, tenor on the second A, and trading off two-measure exchanges for the C section. This recording is available with Minus You audio tracks for all instruments. Note that the lead sheets for the Byrd/Gryce version and the Minus You Gryce Project versions are identical and are in E-flat concert, while the Farmer/Gryce version is in D-flat and the Art Blakey version is in A-flat. Our lead sheet editions state the melody, originally played by Donald Byrd (trumpet) on the Byrd/Gryce Jazz Lab recording shown above, to the left. If you also get the second parts from that page, you'll have Gigi's quintet arrangement. The melody part lead sheet is all you need for any minus you or minus melody player. Don Sickler: About this recorded arrangement: Our Gigi Gryce Project recording is quintet, with two horns. I wanted to keep the basics of Gigi's Jazz Lab, Modern Jazz Perspective arrangement. I kept his intro, except I gave the alto sax the melody with the tenor in harmony, instead of Gigi's original with trumpet melody and alto harmony. I also kept Gigi's horn harmony parts during the melody, but changed the perspective. To start with, I suggested a slower tempo, and, from the start of the melody, changed the horns to a melodic trading affair (from alto to tenor) rather than unison horns. After melodically trading eight-measure A sections, with the second horn always adding the harmony part at end of each A section, they trade 4s for the bridge, while the other horn plays Gigi's harmony line; then they play 2s to start the last A section before jumping into unison to set up harmony in Gigi's classic extended ending phrase. We're making duet versions of a few of our songs available, as we feel this is an important educational tool. Any two melody instruments can play these; we have C, B-flat, E-flat, and C bass clef transpositions. In addition, we have Minus You audio tracks of each of the two parts for solo practice purposes. This version of Social Call is based on the same arrangement we use for "The Gigi Gryce Project" recording. Because the intro has a two-horn arrangement already, the same accompanying line is used for the second part here as on the quintet version. This applies to the bridge and everywhere else where the horns are harmonized. The rest of the melody is also harmonized, with the second part outlining the changes and adding some fills on the longer melody notes. The Minus You tracks consist only of the head, but when played as a live duet it could be opened for solos; the changes are notated. The B-flat version written for trumpets (as heard on the recording) can also be played on other B-flat instruments of similar range such as clarinet. However, this version goes below the written range of the tenor sax. Accordingly, we have a separate B-flat Tenor Sax edition notated an octave higher. Richard Wyands and saxophonist/composer Gigi Gryce recorded quite a few times together in 1960 and 1961, almost 40 years before our "Gigi Gryce Project" recording in 1999. Three consecutive albums, in March, May and June, 1960, are represented on jazzleadsheets.com: "Saying Somethin! ", "The Hap'nin's" and "The Rat Race Blues." All three were recorded by engineer Rudy Van Gelder at his then-new Englewood Cliffs studio. Rudy was delighted to see and record Richard again, in 1999, playing Gryce's music.